The Arctic wolf lives in northern Canada, Alaska, Greenland, Iceland and northern Europe. This furry, fierce species is capable of doing many great things. Arctic wolves have many amazing features. For example, they can handle cold temperatures all year. They can also spend five to 12 months in the dark. Arctic wolves weigh 25 to 40 kilograms and are 60 to 91 centimeters in size. An arctic wolf male grows stronger and larger than the female. Wolves take up a lot of space. The Arctic wolf is a big animal, therefore making it easy for it catch prey. The Arctic wolves' diet consist of lemmings, rodents, and the arctic hare; however, its favorite is the caribou. The Arctic wolf can have three to four pups at a time and is born between May and June. Arctic wolves can live to be seven to ten years old. 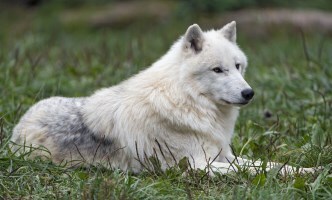 All in all, the arctic wolf is a very interesting creature.